If you’ve ever baked from a pre-packaged cake or cookie mix, you’ve probably noticed the warning that baking times will vary. That’s because the elevation of the area in which you’re doing the baking makes a difference in the baking time required. Living in New Orleans? Then you’re at or below sea level. In Colorado? Then you’re above sea level. Your cake will be in the oven more or less time at the prescribed temp, depending on your location. Last time we learned how the heat energy absorbed by water determines whether it exists in one of the three states of matter, gas, liquid, or solid. We also learned that at the atmospheric pressure present at sea level, which is about 14.7 pounds per square inch (PSI), the boiling point of water is 212°F. At sea level there are 14.7 pounds of air pressure bearing down on every square inch of water surface. Again, I said sea level for a reason. The boiling point of water, just like cake batter baking times, is dependent upon the amount of pressure that’s being exerted on its surface from the surrounding atmosphere. 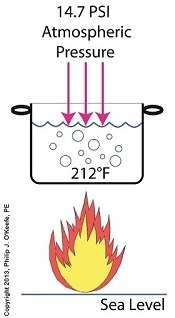 When heat energy is absorbed, it causes the water or cake batter molecules to move around. In fact, the temperature measured is a reflection of this molecular movement. 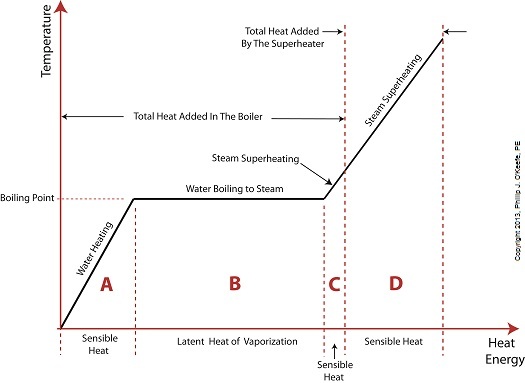 As more heat energy is absorbed, the molecules move more and more rapidly, causing temperature to increase. When the water temperature in our tea kettle reaches its boiling point of 212°F at sea level, the steam molecules in the bubbles that form have enough energy to overcome the atmospheric pressure on the surface of the water. They become airborne and escape in the form of steam. If we’re up in the Rockies at say an altitude of 7000 feet above sea level, the atmospheric pressure is only about 10.8 PSI. There’s just less air up there. That means there’s less air pressure resting upon the surface of the water, so it’s far easier for steam molecules to form into bubbles and leave the surface. As a result the boiling point is much lower in the Rockies than it is at sea level, 196°F versus 212°F. So what if the water was boiling in an environment that had even higher pressures exerted upon it than just atmospheric? We’ll see how to put this pent-up energy to good use next week, when we begin our discussion on how steam is used within electric utility power plants.